I enjoy seeing the many projects out there that have to deal with movement and interaction (Example 1, Example 2, Example 3, Example 4); however, I'm starting to believe we're seeing too much replication and not enough immersive play elements or game design elements. That's not to say that these projects aren't totally awesome - I can't do any of these projects - I'm simply commenting as an outsider who sees massive potential in these interactive architecture and exhibits to help to combat a sedentary lifestyle and low amounts of physical activity. The wall is powered by 3 Arduinos, 5 Maxbotix LV-EZ3 proximity sensors, 12 servos and 2 TLC5940s that control 32 high power led drivers that power 64 3 watt LEDs for RGBW color mixing. FYI - Terrible soundtrack so make sure your sound is not turned up. Although not motion sensing, the LightSpace Floor and Makato Arena will be on display at the Games For Health in Boston next week with Tommy, Ed and Parker from Exergame Fitness. Audience - rAndom International from Chris O'Shea on Vimeo. Tone Garden from Stephanie McCarty on Vimeo. Anthros from Rich Gilbank on Vimeo. 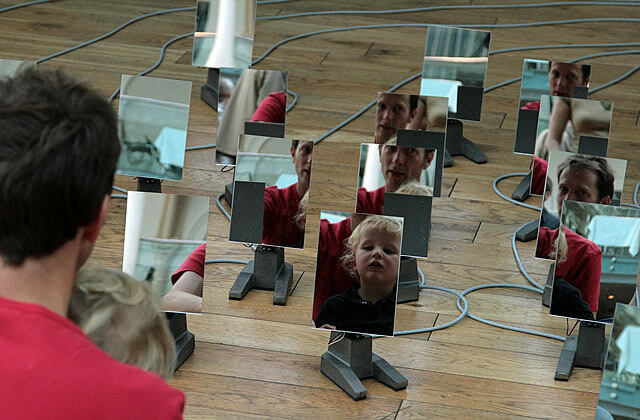 Anthros is an interactive installation which leverages the characteristics of emergence for an immersive experience. It was shown at Meta 2010 at Arta Gallery in the distillery district of Toronto, Ontario. Nick Hagman (AKA DJ17Nario) has hacked lots of things including using a Guitar Hero (via Openchord.org) to play Virtua Figher but in the more physically demanding arena, he played (and beat it on the 15th take) Super Mario Brothers on NES Virtual Console on the Wii and used the NES dance pad as the controller. Remember when games could be finished in 10 minutes (after lots of practice)? 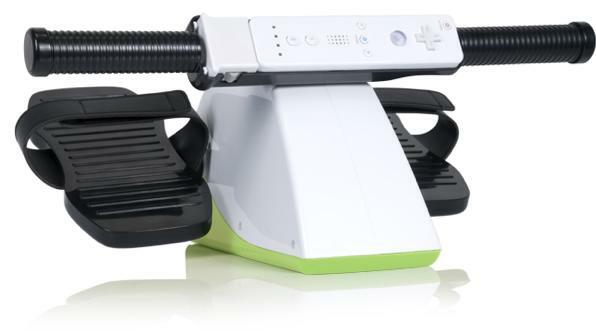 Now my question is can either the NES dance pad or the newer Wii dance pads or Outdoor Challenge pads can be used as alternate game controllers on current Wii titles? Be sure to check out Judy Shasek's Footgaming site for all matters related to playing hundreds of PC (Flash-based) games using a dance pad and pc controller/adapter. In less than a week we will be putting the wraps on the biggest and best Games for Health Conference in Boston, MA. With 6 different tracks including ExerGaming/Active Gaming, Games for Sensorimotor Rehab, Cognitive & Emotional Health and more, there will be plenty to see and do. Be sure to follow me on Twitter (@syangman) and this blog for more exciting details of the G4H 2010 and be sure to use the hashtag #GFH2010. Check out some highlights from last year’s conference and many of the great speakers we had lined up. This year’s line-up is massive especially with Dr. Richard Marks giving the Keynote on the Opening Day. His talk called “The Mind-Body Experience of Sony Move: Relationships between Gaming, Play, Exercise, and More!” will explore the many hurdles Sony's developers faced trying to follow-up on the success of EyeToy and adding new peripherals for improved game-play. I still love EyeToy for its simplicity and ease of play for all generations and all abilities. I am a little worried about the current generation of controllers that are getting so sophisticated that it will make it harder for people with disabilities to interact with the games. Analog Tetris is project out of Codeco.org that has blocks of wood that slide on an inclined plane and like the real tetris, you have to place them correctly before your stacks overflow. Sort of reminds me of the arm-wrestling Tetris I featured a while ago. Watching the video it becomes evident you can move your pieces after they've fallen and it's not clear how you clear your row/ blocks. Otherwise it looks pretty fun and I'd definitely give it a whirl. You can even rent the Analog Tetris for your next event. Be sure to check out iDANCE and LightSpace at the Games for Health Conference in Boston, MA next week. 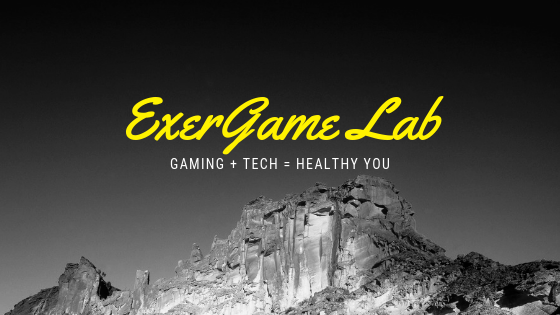 Play those two games and more to win great prizes from the ExerGame Lab and other members of the ExerGame Network. Please take the following poll to weigh in on your thoughts. The results of this poll will be featured at the upcoming Games for Health Conference in Boston, MA - May 25-27, 2010. 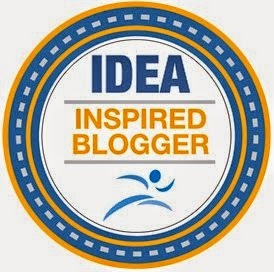 On a side note, I would love to be a part of the Innovation Summit mentioned on their website so that I can bring a more rounded perspective about exergaming and active gaming and their health benefits. 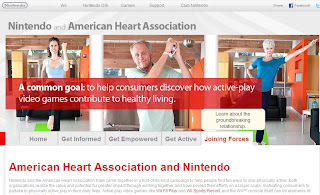 Today, Monday, May 17, 2010, ABC’s Good Morning America aired a story on the American Heart Association’s just announced strategic relationship with Nintendo of America (NOA). We would like to provide some additional information to paint a more complete picture of this important announcement. The AHA/NOA relationship is focused only on the “active gaming” products of Nintendo. In addition, the American Heart Association and Nintendo will also jointly launch an online information center at www.activeplaynow.com, where visitors can read about the benefits of physically active play, conduct personal assessments and learn more about living a more physically active lifestyle. 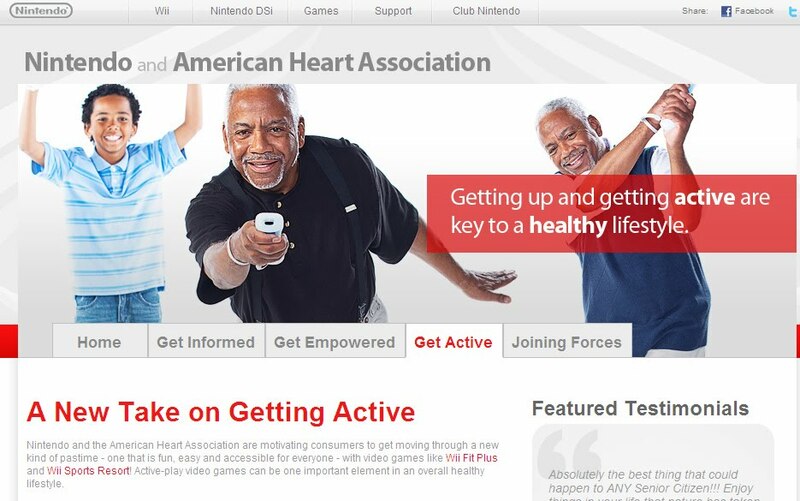 The GMA story implied that the AHA is endorsing all Nintendo Wii games, including those that are sedentary. This is not accurate. 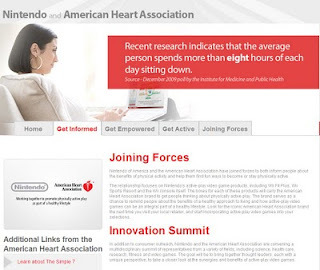 The AHA and Nintendo logos, along with the statement defining our relationship, “Working together to promote physically active play as part of a healthy lifestyle”, will be on boxes for the Wii Fit™ Plus and Wii Sports Resort™ software and for the Wii™ system that plays them beginning this summer. 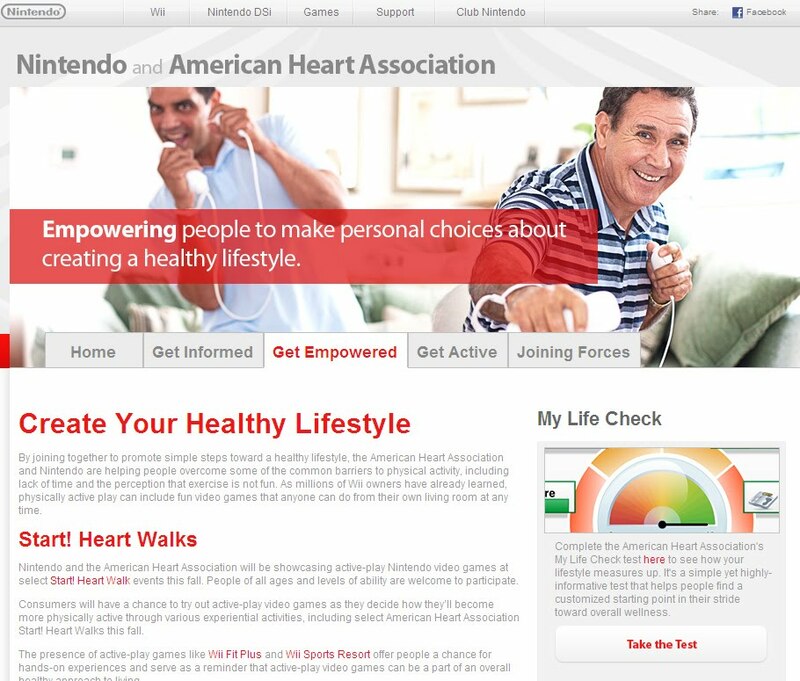 With Nintendo, AHA reaches an important new audience, those currently playing video games, with a message that encourages people to choose the more physically active versions of these games. This is important because so many Americans are completely sedentary. We need to meet people “where they are”. So, while we first and foremost advise all Americans to meet the recommended levels of physical activity, we also recognize the importance of getting those who are totally inactive to start by doing something. Our message is one of incremental change: if you’re doing nothing, do something; if you’re doing something, do a bit more. This is the core of our goal to ‘improve the cardiovascular health of all Americans by 20% by the year 2020’. We believe we must be bold to be successful, and we assure you that the American Heart Association refuses to sit on the sidelines, or stand around helplessly, watching as physical inactivity increases Americans’ risk of developing heart disease and stroke. Rather, we are going to ‘get in the game’ and get active to address this growing crisis. GMA interviewed an epidemiologist with the CDC, who stated, “the amount of activity that one gains from these active gaming devices is inconclusive in terms of its benefits on health”. However, common sense says any time spent in physical activity is better than no time, and as people choose leisure time activities, it is important for us to encourage them to move from sedentary activities to those that get them moving. Actually, there is recent research that points out the substantial impact even of posture on the calories we burn during our non-exercise periods. Standing is better than sitting is better than lying down on the couch or in the recliner. This supports the idea that even small changes can be beneficial. We strongly support research that can establish conclusively the long-term benefits of physical activity, but the enormous numbers of people who are very sedentary can’t wait for that research, and we feel it would be inappropriate to wait the many years it will take for the final results of such research to be delivered. An innovation forum that will be supported by funds from the sponsorship, but developed with complete freedom by the AHA, will bring together investigators in the very areas of research critical to moving this field of prevention forward. GMA reported, “we looked at their marketing documents, which say that carrying the label is proven to boost sales, (leading to) big money for the Heart Association and big money for the manufacturers.” However, the logo and materials that GMA were referring to were associated with our “Food Certification” program, which is, by design, revenue neutral. That means that the fees taken in go to cover the costs that it takes to run the program, as well as educate the public on nutrition and how to make healthier food choices. The Heart Check program, which consumers trust and understand, does charge food companies who believe they have products that meet our nutritional and marketing criteria a service charge to participate in our program. The service charge covers the costs for staff to compare products against the criteria, for the laboratory analysis of products, and to educate the consumer about the program. We determined when we developed the Heart Check program that we wanted to keep this program separate from our donor dollars. The donations from volunteers and supporters that the AHA receives covers research and our professional and public education efforts. As for the money Nintendo contributed to the American Heart Association, the majority of the $1.5 million funds our prevention platform, aimed at educating Americans about heart disease and stroke prevention. A portion of the money funds Nintendo’s presence at our local Start! Heart Walk events across the country. Additionally, Nintendo is contributing $350,000 for a multidisciplinary forum of representatives from areas such as health care, research, physical activity, fitness and video gaming. The goal will be to bring together thought leaders, each with a unique perspective, to take a closer look at the synergies and potential benefits of active-play video games and physically active lifestyles, as well as to suggest urgent areas for research in the future. Is Wii Worthy of American Heart Association Accolade? Dr. Richard Besser Questions American Heart Association Chief About Heart-Healthy Stamp on Video Games. Here is my post on the ABC News piece on Nintendo getting the American Heart Association (AHA) to endorse the Wii to the tune of $1.5 million, and I doubt that does not include the advertising, marketing, and printing costs involved for the US and Canadian markets. Any ad people know what this might cost across the lifespan of the product cycles? A poor estimate would be several times more than the $1.5 million given to the AHA. The partnership has cumulated in the Active Play Now website. Nintendo does not shy away from funding and/or endorsing research projects and this current endorsement is really interesting and creates another ethical dilemma. 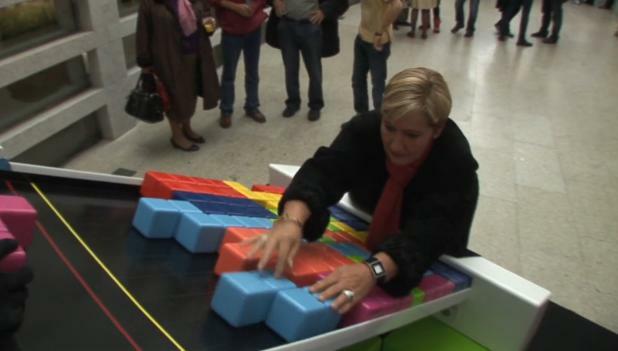 Having used and researched these exergames for almost a decade, I do think they can be used effectively to increase physical activity levels and promote positive social interactions; but, I also know that they are not a "magic pill" to better health. I think this story would be a completely different if in fact no money was exchanged. It brings up an interesting debate on whether all of these "endorsements" should have a "disclaimer" or "full disclosure" so that the public really knows what's occurring behind the scenes. If bloggers and celebrity endorsements (and these two categories couldn't be further apart) are liable for not disclosing relationships - then so should these commercial endorsements. Without Dr. Besser's pushing at least twice for the amount of money Nintendo gave to the AHA.....we might never have known. Thanks Dr. B and ABC. Fox 45 in Baltimore was nice enough to invite Exergame Fitness to be an exhibitor at the BMore Healthy Expo on May 1st, 2010 at the Baltimore Convention Center and the Fox 45 Morning Show. Exergame Fitness was kind enough to invite me to to speak at both events and we had a blast with everyone. Thanks Tommy, Seilheimer, Ed Kassanders, Parker Johnson, Megan Gilliland, Jennifer Haigle and the Fox 45 Morning Crew! We had a blast on the morning show and at the BMore Healthy Expo was a huge success. Megan led by example and soon had the whole crew trying out iDANCE and BrainBike! Congratulations to all at FOX 45! Forget step counts using the accelerometer, the iPhone is about to become much more of a medical device if Apple gets the FDA & FCC's to approve its external heart-rate (HR) monitoring peripherals to feed into the iPhone. Although another device has already been cleared to accept HR via the Raisin Health Monitor, according to the USPTO application the device will be able to identify HR, the individual user, and even mood. Skip the mood ring, bring on the iPohone! Apple Wants to Know You By Your Heartbeat [Apple]: "
Using the detected signals, the electronic device can identify or authenticate the user and perform an operation based on the identity of the user. In some embodiments, the electronic device can determine the user's mood from the cardiac signals and provide data related to the user's mood. Too much time in front of the tube as a two-year-old can predict some negative consequences at the age of 10, a new study suggests. Researchers studied more than 1,300 children in Quebec and found that higher TV exposure as toddlers corresponded to less achievement in math, an increase in being victimized by classmates and less physical activity at age 10. The children also had a higher likelihood of consuming more junk food and soft drinks and of having a higher body mass index, according to the study published Monday in the Archives of Pediatrics & Adolescent Medicine.